Growing up, my mother did the cooking at home. On the rare occasions that my mother went away for a week to visit family or for a physician’s conference, my father would be left to attempt feeding us. Unfortunately for my brother and I, but fortunately for you, he only knew how to make two things: runny scrambled eggs and overcooked steamed shrimp. I left the runny scrambled eggs in the past, but I took the rough recipe for this steamed shrimp dish and made it better. Shrimp is delicious on its own and doesn’t require much to make it good. You just have to be careful not to overcook them. Nonetheless, if you love shrimp, but would like to try it with some different subtle flavors, I would suggest giving this recipe a try. The onion and tomato in the recipe give the shrimp a bed to steam over and the orange adds a non-lemon citrus fragrance without overpowering the natural flavor. 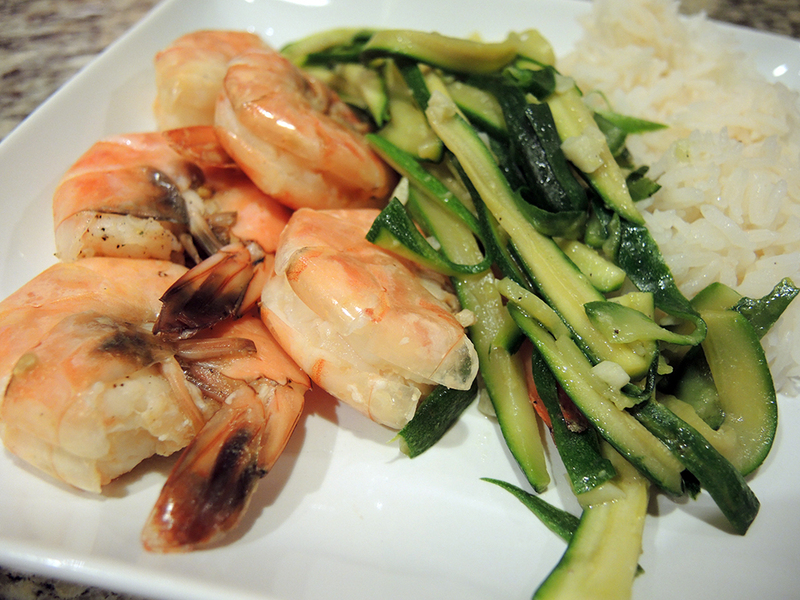 The onion, tomato, and orange creates a bridge between the shrimp’s sea flavor and the earthier julienne baby zucchini that I paired with the dish while the butter in the zucchini complements the sweetness of the shrimp. Makes 1 pound of jumbo shrimp (about 20-25 shrimp) at 480 calories total or 120 cal per 4 oz. (about 24 calories per shrimp). + about 2 cups of buttered, steamed zucchini at 147 calories total. + optional white rice at 150 calories per 1/4 cup dry or 1/2 cup cooked. 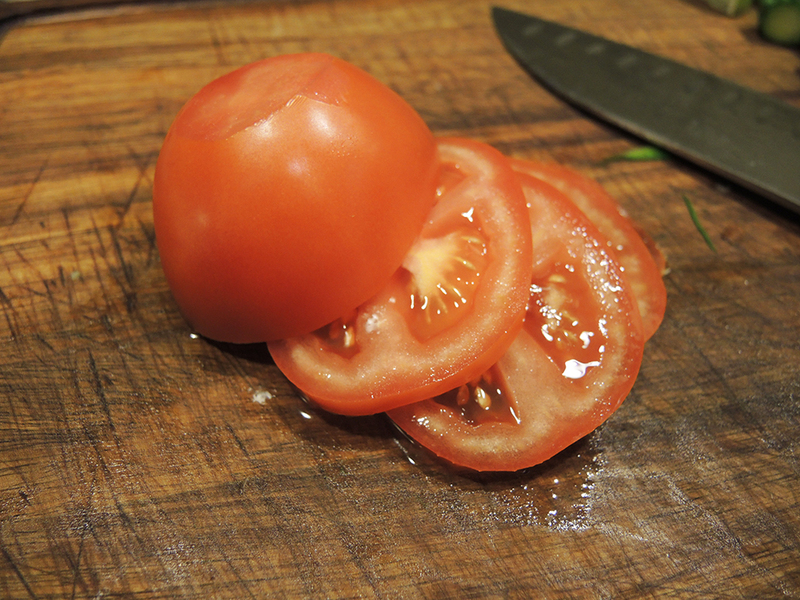 Slice up one tomato into enough thick slices to cover the bottom of your pot. 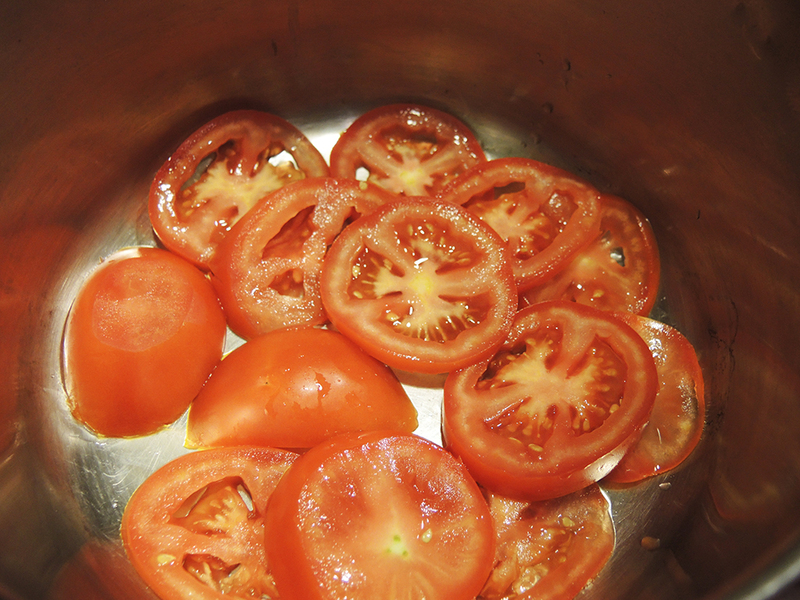 Lay the tomatoes in the pot so that they cover the entire bottom. 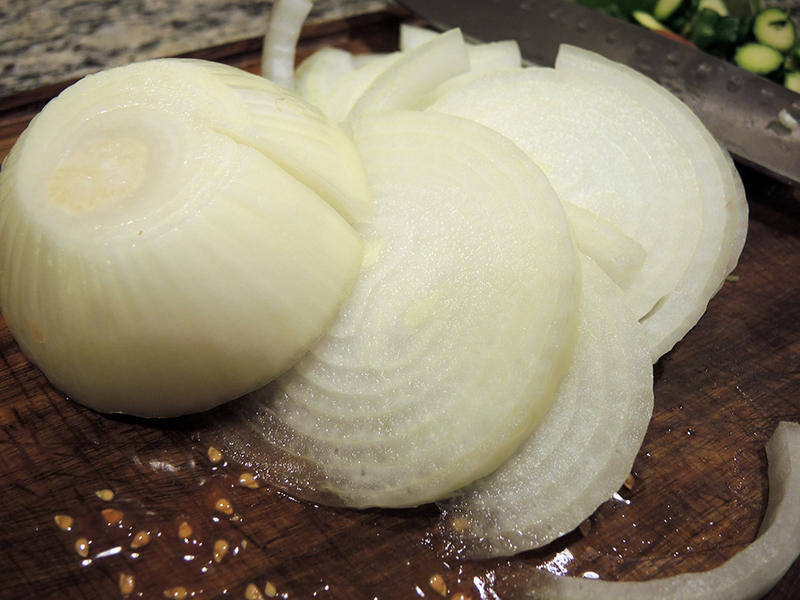 Cut up half of the onion into large slices just like the onion. 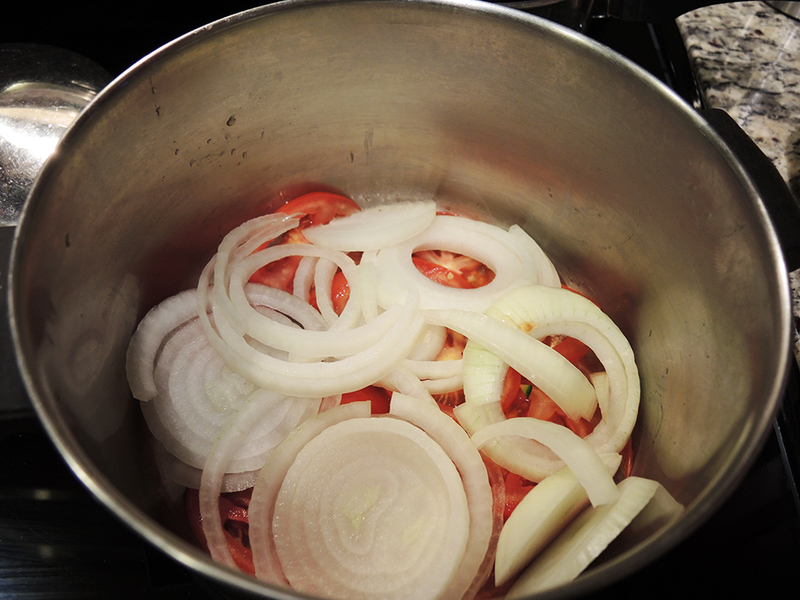 Lay the onions over the tomatoes at the bottom of the pot. 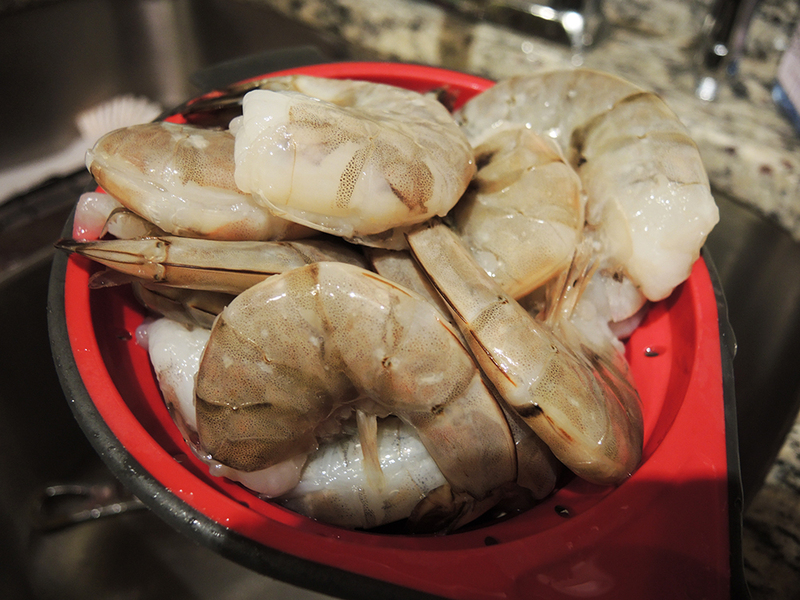 Rinse off the deveined shrimp in colander to get any ice or stangant water off of the shrimp. I like to buy deveined shrimp because I’m lazy and they are easier to peel, but you can buy unprepared shrimp and do the work yourself. Or you can get really lazy and just devein them after cooking when you peel them, but that puts some people off, so do so at your own risk! 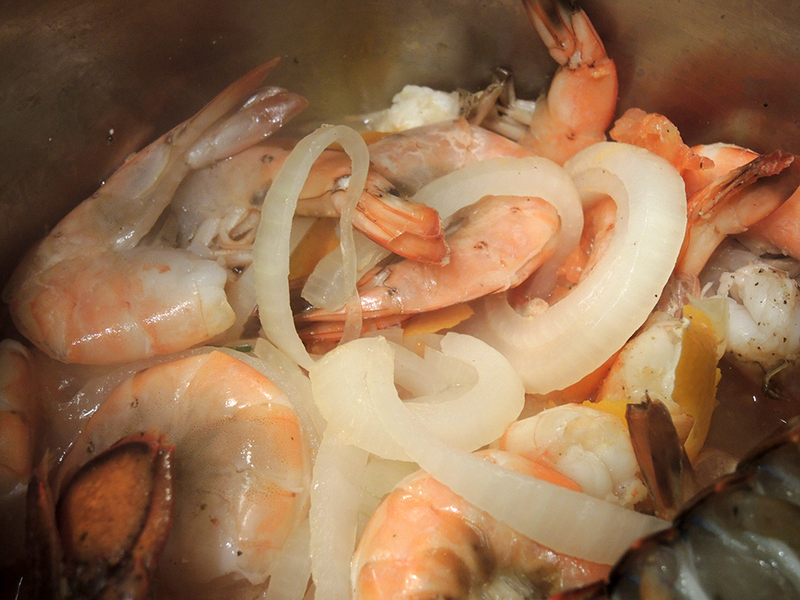 Place the shrimp in the pot over the tomatoes and the onions and sprinkle a few dashes of salt and pepper over the shrimp. 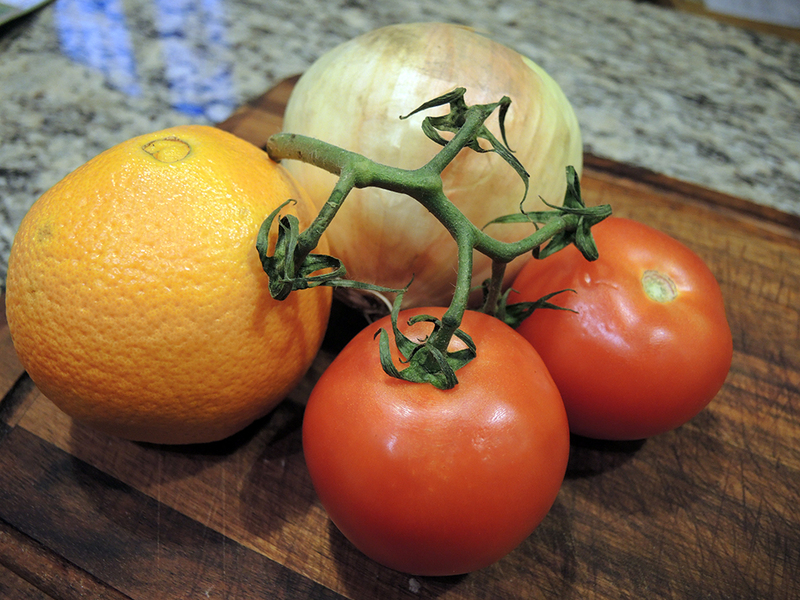 Lightly mix them without disturbing the tomato and onion layer. 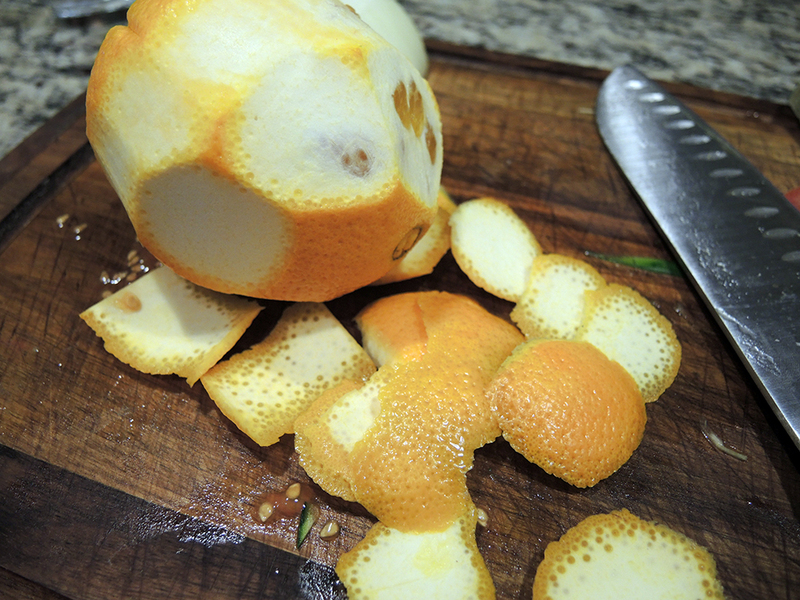 Wash the orange and using a sharp knife, shave off pieces of the peel. You don’t need to shave the whole orange. Just about half or a little more than half. You can also just peel the orange instead of cutting it if you want to eat the orange right away. Lay the cut orange peel pieces over and throughout the shrimp. Turn the stove on to medium heat and bring the pot up to a simmer. The orange and tomatoes will start to release fluid as will the shrimp. 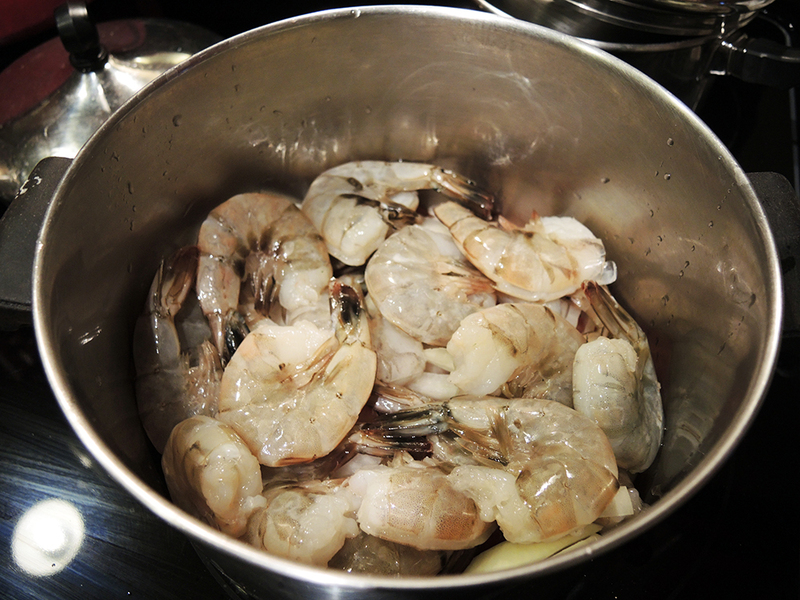 Once you hear the simmer, lower the heat to medium-low and steam the shrimp with the lid on for about 10 minutes. After 10 minutes, check the shrimp and see if they have all changed color. They should become orange in color. If some of them haven’t changed color, then very lightly stir the pot to mix the shrimp. Cover the pot and let the shrimp sit for another 3-5 minutes. The shrimp is done when all of the shrimp has changed color and the shell just starts to separate from the body of the shrimp. 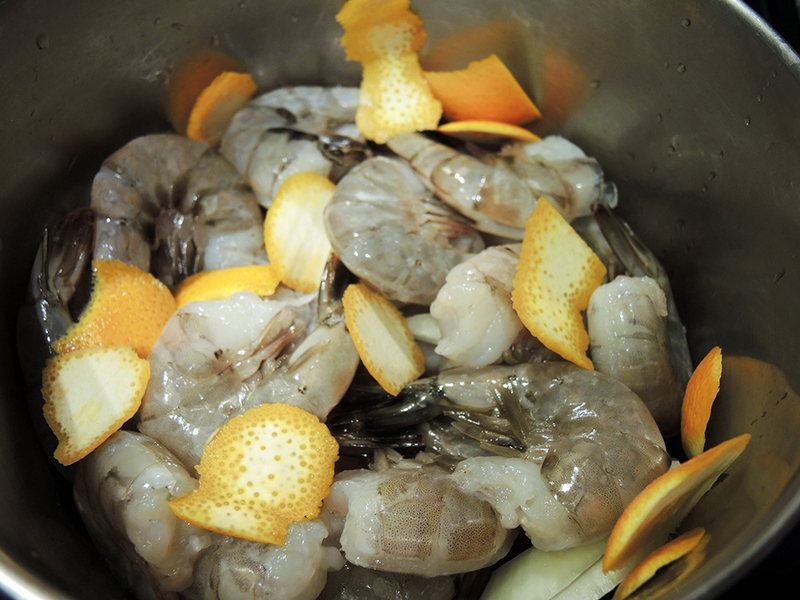 Remove the shrimp and place the shrimp along with the pieces of orange peel into a large bowl for serving. 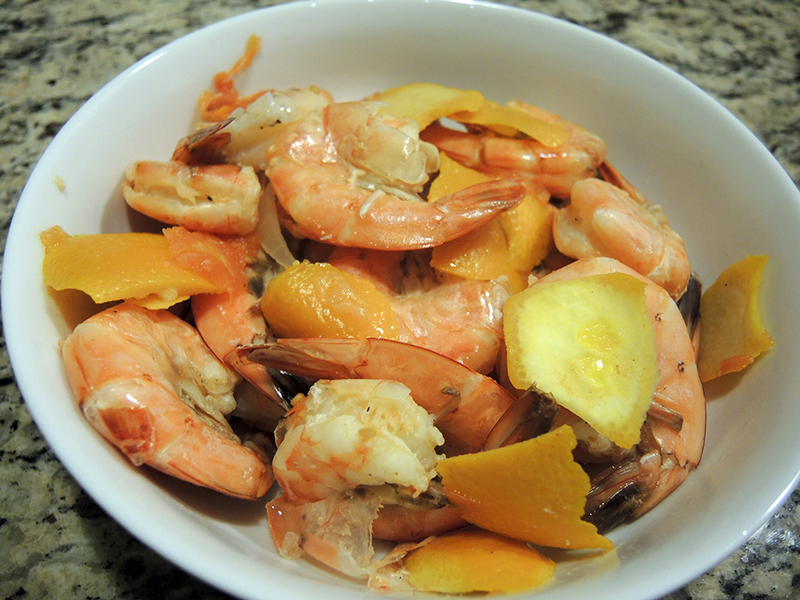 The orange peel slices carry the aroma along with the cooked shrimp. Save the water in the pot because if you add a little salt, it makes a great base for a broth or you can flavor rice with it for refreshing taste of the ocean. 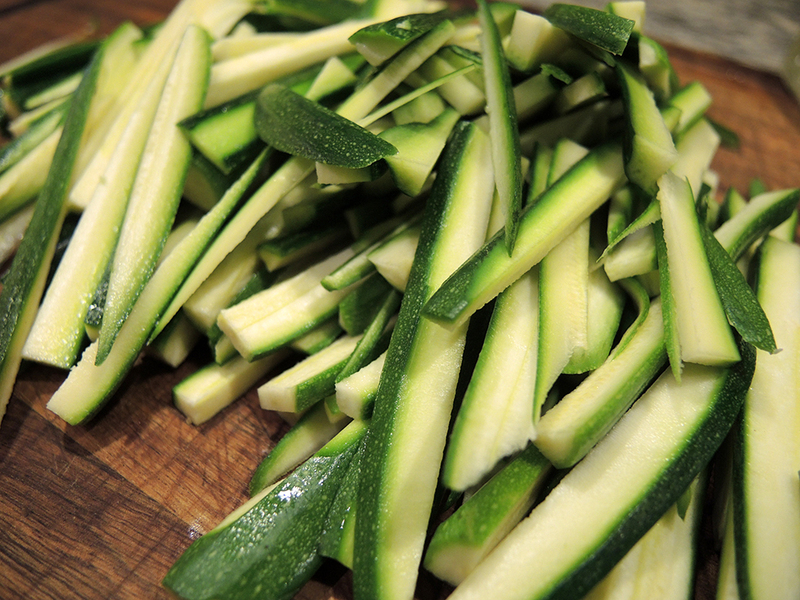 Wash, cut off the ends of the baby zucchini, and slice them length-wise in half before continuing to cut each half length-wise in a julienne style. 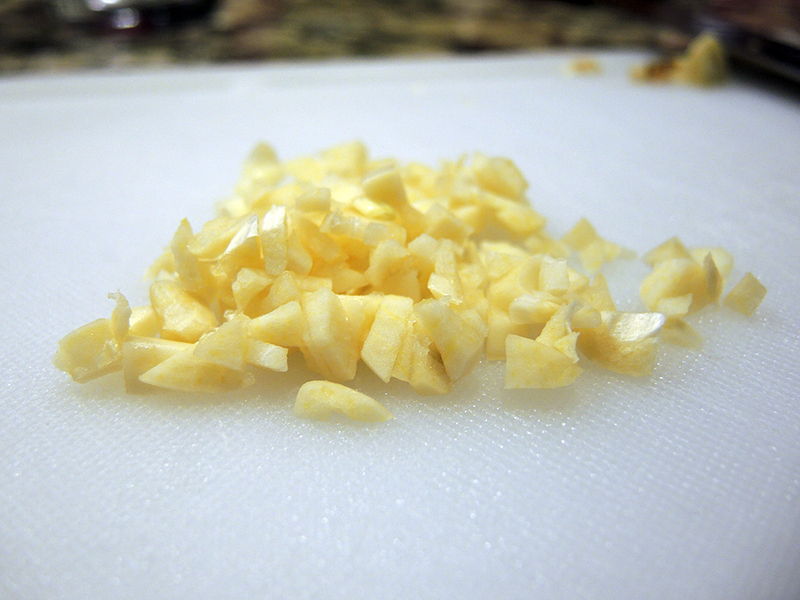 Dice two cloves of garlic. 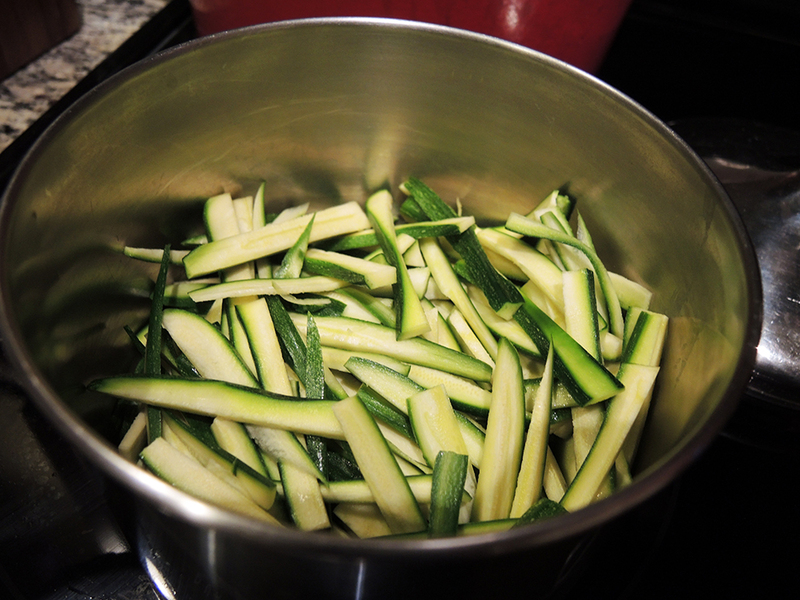 Place the zucchini in the pot on the stove and set the stove to medium heat. Add in the garlic and the butter to the zucchini and mix thoroughly. Season lightly with salt and black pepper as well. 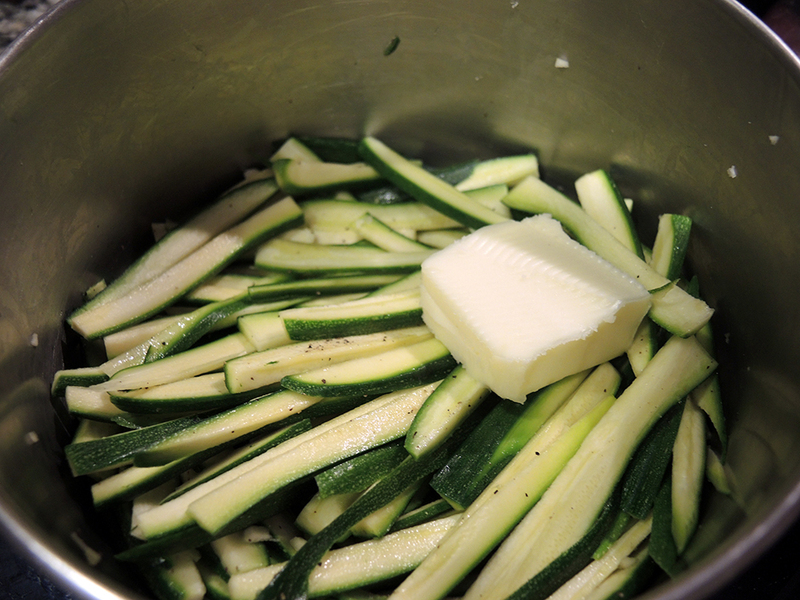 Keep mixing the zucchini until the butter melts. Then cover the pot and steam the zucchini for about 10 – 15 minutes until all of the flavors are incorporated and the zucchini is soft, but not falling apart. About half-way through, open the pot and mix the ingredients really well. 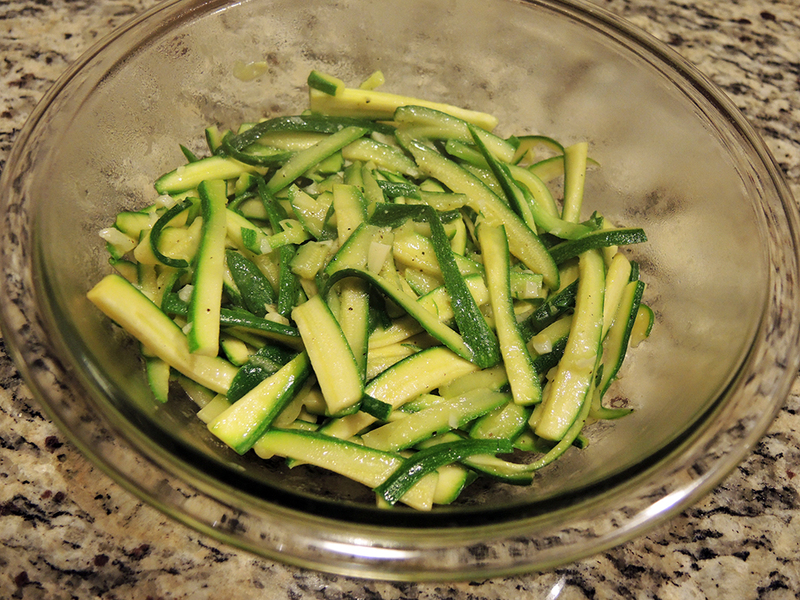 When done, remove the zucchini and place into a bowl for serving. Make some white rice and flavor it with the broth from the shrimp. 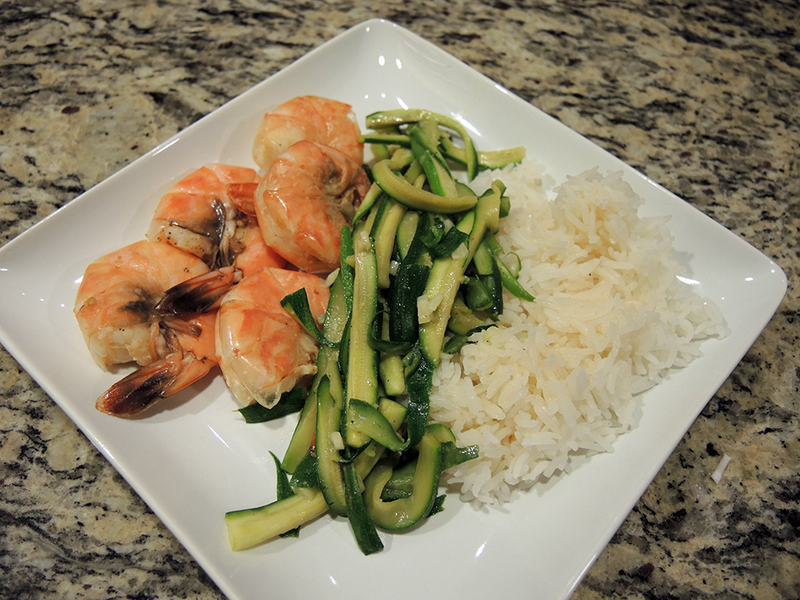 Place 4-5 shrimp on a plate and pair with the zucchini and rice for a dish with a lot of different flavors that also work really well together. You can also try melting a little butter per person and dip the shrimp in the butter to completely change the flavor profile. Very nice indeed. Shrimp are so versatile. Though the thought of the runny scrambled eggs makes me feel unwell! Yes… runny scrambled eggs are not on my menu. Try not to dwell on such nightmarish things! ha! I’m the only one in my family who loves shrimp. But I like your layering idea with the ingredients for this dish. I’m always shocked when I hear a person doesn’t like shrimp. I’m a big shellfish fan. This recipe is a bit different and the flavors are unlike any other shrimp dish I’ve had anywhere else, so I recommend it if anyone is feeling bored with the usual shrimp. My husband, though he has tried, really doesn’t like seafood. My daughter liked shrimp for awhile but maybe if I mix it up a bit she’ll try again. This is a really interesting (and less work/time intensive) cooking technique: using food with high water content to steam the dish itself. 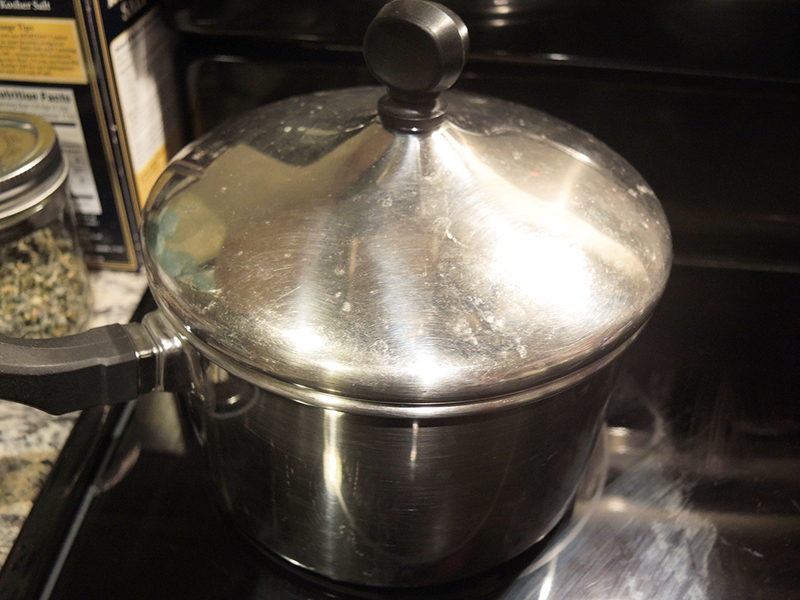 Steaming is great, but in Chinese cooking, you fill the bottom of a cooking vessel with water, use some sort of contraption to hold another vessel above the water, place the food in the elevated vessel, and cover. Such a hassle I rarely bother. Excited to try this. Also impressed all around by the website posts. At first I thought “This is really well written for a blogger…” Then I read your bio and found out had a background in law. I appreciate the kind words about the writing quality and you make some astute observations about using a food’s own moisture to steam it. Don’t get me wrong, I love Chinese style steaming, but sometimes you can get away with it if the foods you have create their own moisture. Thanks for stopping by and I’m glad you’re enjoying the blog!